Skin thickening is a common symptom in scleroderma that is caused by scar tissue. 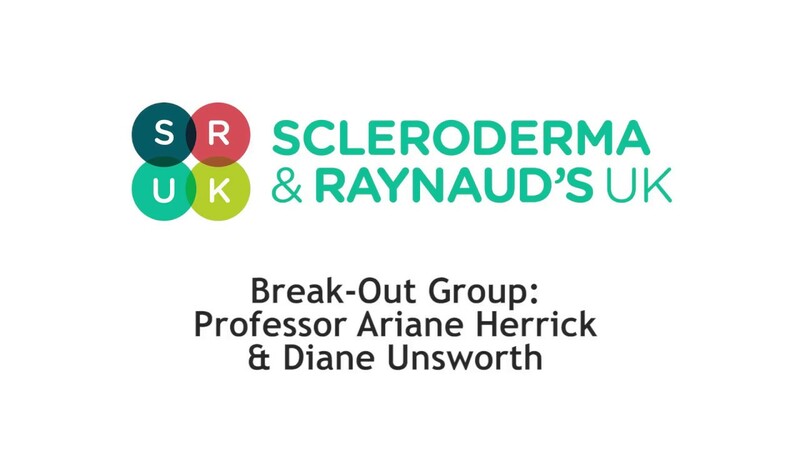 In systemic sclerosis, this scar tissue or 'fibrosis' can become a very serious problem as it forms in internal organs such as the lungs or the kidneys. In systemic sclerosis, the body's immune system becomes overactive. One of the important ways that the immune system deals with injury or infection is by causing inflammation. But if the immune system is continuously 'switched on', then the inflammation can cause damage to the body rather than healing it. Normally, following injury or infection, inflammation helps the body repair itself by triggering the process that leads to healing. Following a bad injury, a necessary part of the healing process is scarring. In systemic sclerosis, excessive and continuous inflammation ultimately results in the development of scarring or 'fibrosis'. Although it is quite common for kidney function to be mildly reduced in scleroderma, this is not usually a significant medical issue – the scleroderma makes the kidneys run at 50-70% of normal, and that is plenty for them to do their job adequately. However, about 5-10% of people with systemic sclerosis (usually, but not only, those whose skin is worsening fast) develop severe uncontrolled high blood pressure from narrowed blood vessels within the kidney. Over a short period of time the narrowed blood vessels starve both kidneys of blood and oxygen, setting in motion the response of raised blood pressure. This eventually destroys the kidneys and damages the heart and lungs of the patient if left untreated. 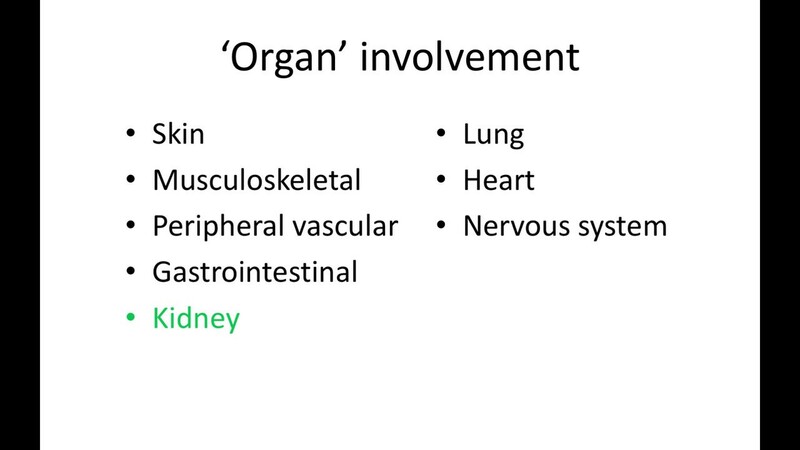 Everyone with scleroderma renal crisis will need to be looked after in hospital initially. Some will be ill enough to require intensive care, coronary care, or the specialist renal ward. Blood pressure medication will be given, and dialysis may be required if the kidneys have failed completely. For people who don't recover after two years of dialysis, a kidney transplant is a possibility. Heart disease becomes more common as we get older, so it is not surprising that heart disease is often found in people in their 50s and 60s with scleroderma. Systemic sclerosis can also directly affect the heart, so people with the condition are at greater risk of heart disease than others. When heart disease is severe then symptoms are the same as for everyone else, with breathlessness, chest discomfort, swollen ankles and palpitations. Coronary heart disease – systemic sclerosis may slightly increase your risk of developing the most common form of heart disease. Coronary heart disease causes angina, heart attacks and heart failure. Systemic sclerosis heart disease - the most common type of heart disease directly caused by systemic sclerosis is increased strain of the right heart due to pulmonary hypertension. Around one in ten patients with systemic sclerosis have high blood pressure in the lung arteries. This increases the work of the right heart, causing it to thicken and eventually fail. Valvular heart disease, especially aortic stenosis (narrowing of the main valve that controls blood flow leaving the heart for the rest of the body) is common in elderly people. It seems to be just as common in people with systemic sclerosis as everyone else. Symptoms are similar to coronary disease (above) although blackouts are more likely. Hypertensive heart disease – this happens when the heart has to work harder to deal with high blood pressure. The muscle of the heart is thickened which can lead to rhythm problems (palpitations) and heart failure. High blood pressure affects nearly 50% of middle-aged people and is more common in systemic sclerosis because of kidney problems. Rhythm problems - atrial fibrillation (a completely irregular heart rhythm) is one of the commonest rhythm disorders of elderly people, and tends to develop where there is fibrosis of the heart. Pericardial effusions – this is a collection of fluid in the sac that the heart sits in. It rarely causes any problems. It can be due to inflammation of the lining of the pericardial sac or increased pressure within the heart (for example when the heart is responding to high blood pressure in the lungs). Cardiac fibrosis or scarring of the heart muscle can be found in around one in five people with systemic sclerosis. Usually this is just something noticed on scans, but very rarely it can become very severe and cause heart failure. Small vessel disease - coronary artery disease affects the large vessels on the surface of the heart; in systemic sclerosis, the tiny vessels within the heart muscle also show abnormalities that are more prone to spasm and failure to relax properly. This can cause very tiny areas of damage widely spread throughout the heart, which leads to a slightly weaker heart and slowed relaxation. Myocarditis – sometimes inflammation occurs in the heart. 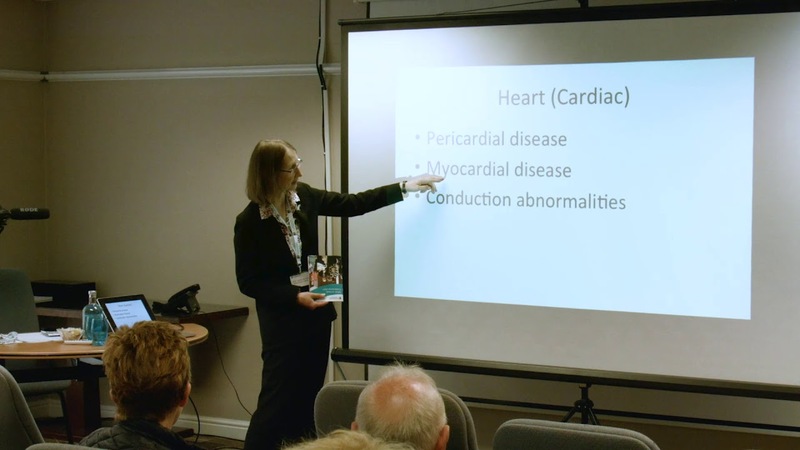 Patients with myocarditis have symptoms of heart failure and rhythm problems; we can now identify this fairly easily with blood tests and scans and treat it with immunosuppression drugs. The diagnostic and treatment process for people with scleroderma is very similar to that experienced by all heart patients. Your doctor will take care during diagnosis to screen for pulmonary hypertension and any signs of thickening or scarring. Any treatment that is needed should be managed in co-operation with someone who understands systemic sclerosis, so your cardiologist and rheumatologist will need to work together. This will help them get the balance right between treating the heart disease robustly and considering the complications the scleroderma causes. Up to half of scleroderma patients have some evidence of lung disease. Although the lung is often involved in scleroderma, not everyone will have symptoms suggestive of lung disease, so it is important to identity it and start treating it as early as possible. Lung disease in scleroderma usually has a long, slow progression, so you have to learn to adjust to what you can and can't do. It is advisable to do regular exercises if you can, and try to maintain a good basic level of physical fitness. Pulmonary hypertension is a rare lung disorder in which the blood pressure in the pulmonary artery rises above normal. This happens in scleroderma when the blood vessels in the lungs narrow because of fibrosis, much as the blood vessels to the fingers and toes are constricted in Raynaud's. This abnormally high pressure affects the small blood vessels in the lungs, resulting in less blood getting to the lungs and less oxygen being carried into the blood stream. As a result the right side of the heart has to work harder to try and compensate for the difficulty with the blood vessels in the lungs. Common symptoms include shortness of breath or feeling tired - especially on exertion or exercise, blackouts, and a very fast heart beat. There are a number of ways of treating pulmonary hypertension, including with medication, oxygen, inhaled treatments and subcutaneous or intravenous infusions. There are also surgical procedures that may occasionally help. 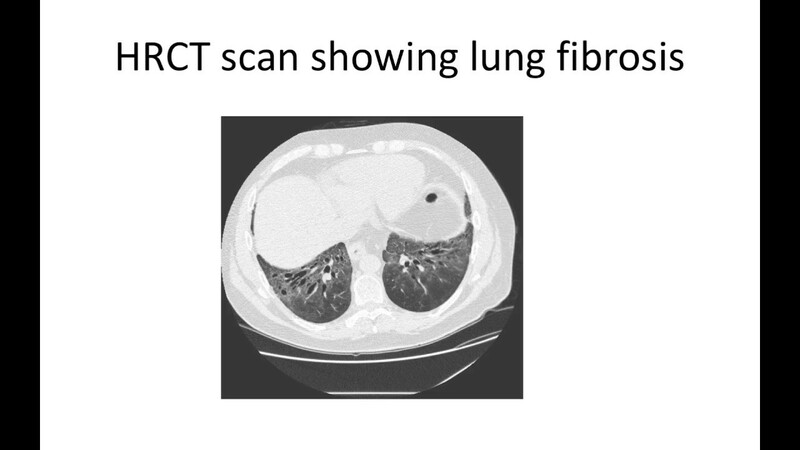 The earlier lung fibrosis is detected, the more likely there is to be a good response to treatment. Fibrosis affects the alveoli, the tiny air sacs in the lungs. These are responsible for transferring oxygen from the air to the blood and removing the waste product, carbon dioxide, from the blood. The cells, which normally defend the body against infection, invade the lungs. While the scarring helps the injured areas to heal, it also results in thickening of the alveoli wall. This means that the areas damaged by scleroderma fibrosis lose some of the elasticity and are therefore less able to perform their normal function. The body's cells that normally protect us from infection appear to be involved in the damage. Breathlessness is the most common symptom, which may be noticeable when taking exercise or when walking up hills or upstairs. There may also be a dry irritating cough. Treatment of lung fibrosis is usually in the form of anti-inflammatory or immunosuppressant drugs, or intravenous treatments. These need to be continued as long as there is evidence of on-going inflammation. For most people with systemic sclerosis and lung fibrosis however, it is usually possible to gradually reduce and stop treatment once the lung disease is no longer active. It is important to realise that this may take several years.